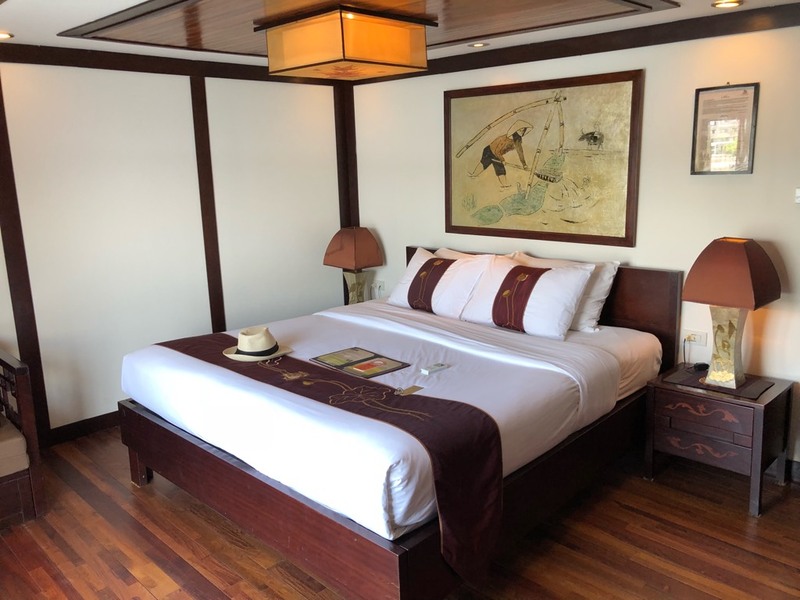 Ah, Ha Long Bay – The Epicurious Wanderers! 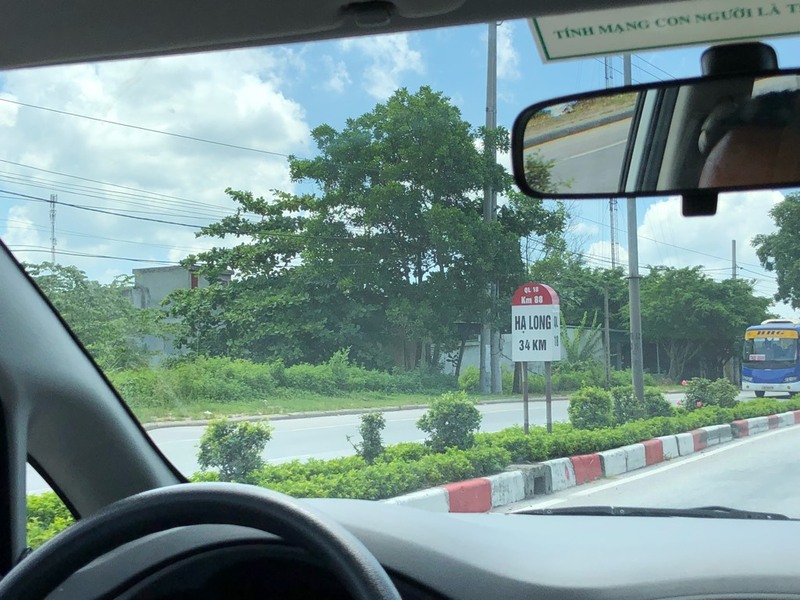 The drive to Ha Long Bay can be an eventful journey, it’s 3 1/2 hours of Vietnamese Roulette. The road rules seem to get looser as we head north though Vietnam, in Saigon there seemed more order to things. As we drive into more ‘rural’ areas the array of vehicles changes, things get older, slower, more chaotic. It’s simply wonderful to sit back and let our driver navigate his way along the highway as we watch the world go by. As the traffic changes so too does the countryside, dense housing gives way to industrial areas that then meld into more rural village life. The vegetation becomes thicker, greener isn’t an option as every shade of green is already represented. 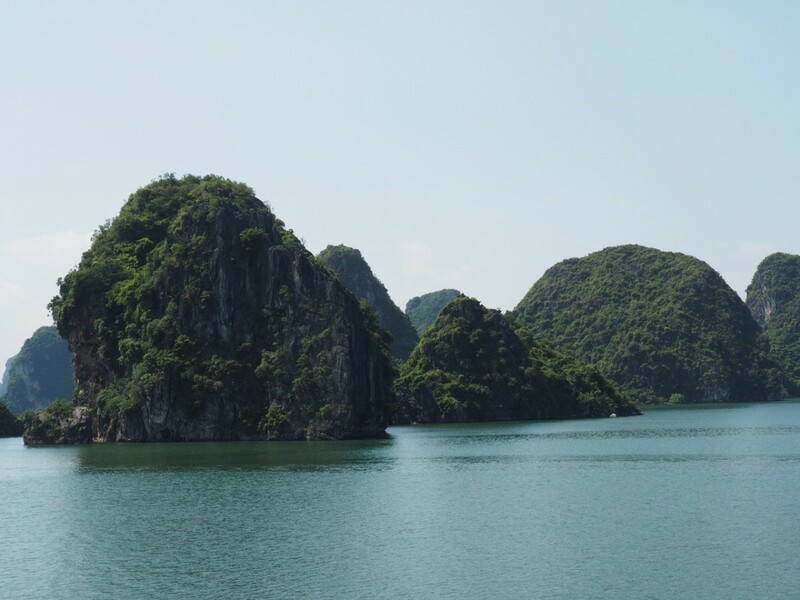 As we reach the coast suddenly the limestone islands that dot Ha Long Bay become visible, just a few at first then a veritable maze of them. 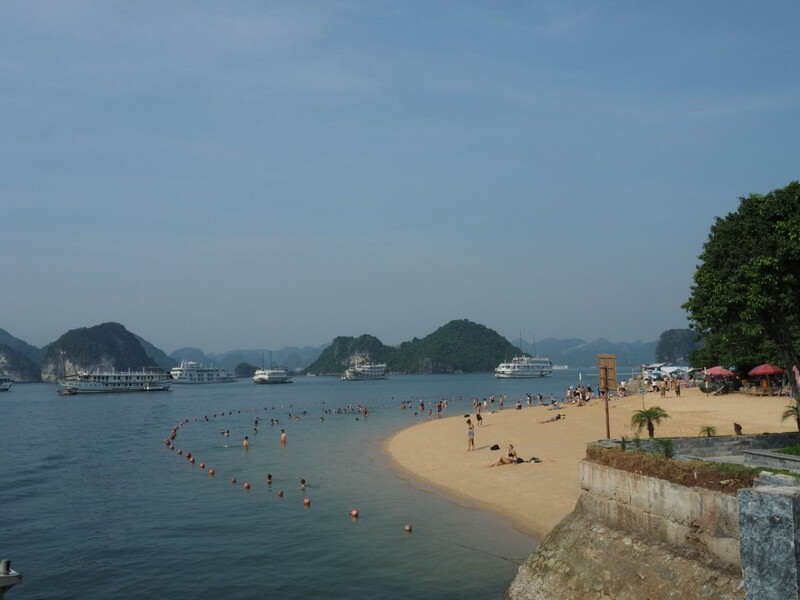 The first challenge is to find our boat, those of you that have been here will remember the sheer number of cruise boat that operate in the bay. There are apparently 1969 island and I reckon 2 boats for each. They range in size from little fishing dinghies to craft approaching ocean going cruise boats. The sheer splendour of some is in stark contrast to the bleakness of others. As we spy our vessel it sits towards the top end of the spectrum, at least from first glance. We’d been told that we would need passports, credit cards and booking documents to facilitate boarding, not quite. A simple ticking of our names on the passenger list was ample proof we belonged aboard. From here it was a transfer by water taxi to out boat, the Indochina Sails. Once onboard all passengers, all 20 of us, are gathered in the lounge area for a safety briefing and explanation of today’s events. Next we are given our cabin keys so we can settle in and freshen up prior to lunch. Helen and I head down to our cabin on the second level, only 20 cabins on the boat. We’ve jagged a suite, it’s amazing! It’s bigger and better equipped than our hotel room in Ha Noi. We have floor to ceiling windows looking out into the vista outside, and a door to our private balcony. Although it’s a little small to sit outside, it is a great spot to take pictures. The bathroom features a bath with a view, turns out it’s also a spa. After a quick refresh it’s upstairs for lunch. Lunch is a multi-sensory experience, great food but also the scenery we’re passing is stunning. Helen sets her camera up on the table and grabs some amazing shots as we enjoy a Vietnamese lunch. Following lunch there is time for more picture taking, I set the DJI Osmo up on deck and take a time lapse sequence of the world going by. The afternoon activity is a trip to Surprise Cave, discovered by 2 French women in the early 1900’s. to reach the cave first you have to climb up 140 odd stairs to reach the entrance, then you descend 140 more into the cave. The first chamber is pretty special, but as you venture further in it becomes breathtaking. The main chamber is immense, apparently they’ve held classical music performances in here. Lots of features have been given names based in their likeness to physical objects, things like Romeo and Juliet amongst others. The rest of the afternoon is free time to relax onboard and mingle with fellow cruisers. While Helen enjoys a quiet bath I set the Osmo up on deck and record a few time lapse sequences. Some of the crew are fascinated by what I’m up to as are a few fellow passengers. As I finish the first sequence many are keen to see the footage. The top deck lacks shade but as the sun sets it starts to cool down and it a great place to sit with a beer or gin and tonic and just relax. Dinner is a buffet affair with a good range of food and our first bottle of red for the trip. $25US for a bottle of New Zealand Merlot isn’t too bad and it is a 2013 as well. 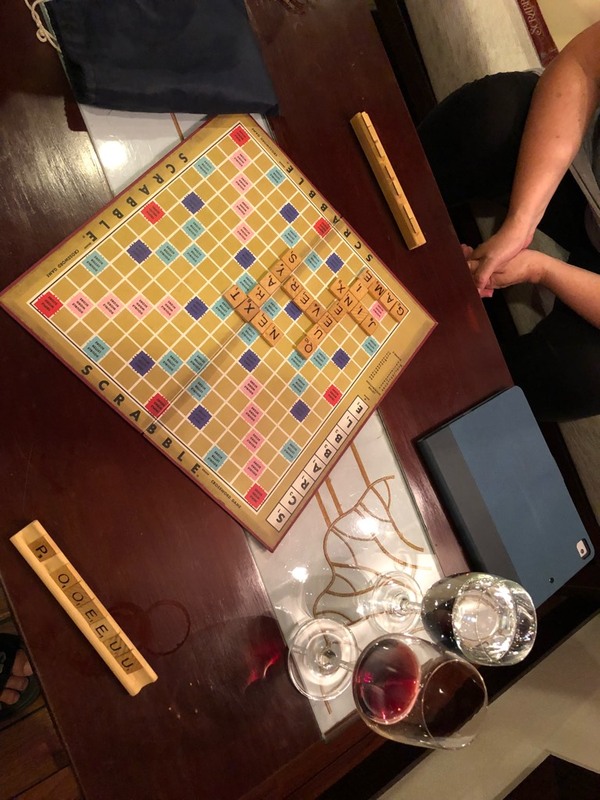 Following dinner we retire to a comfy lounge area to finish our wine and enjoy a strange game of Scrabble, I say strange as the letters seem a bit weird. Most Scrabble sets, well all really, should have 1 X, 1J, 12 E’s etc but ours seems to have 3 X’s, 4 J’s and about 25 E’s; however, we don’t have many D’s, F’s etc. All this makes for an entertaining game. Our cabin as mentioned is very comfy; although as we’re near the front of the boat the floor has a slope to it as does all the furniture. Every time I get up off the bed it’s as if I’m going to career head first into the bathroom door, talk about hitting the ground running. We’ve moored a reasonable distance from other vessels however, the thud thud of the bass from a nearby party boat still makes its way into our cabin. We expect that it may cease by about 1am, but no at 5am the party is still going, not intrusive enough to prevent sleep though. Coffee and pastries are to be served from 6am, with Tai Chi available at 6:30am. As we head upstairs at around 7am, missing all of this, we get ready to board the water taxi for this mornings outing to Ti Tot Island. Here we can climb to the top for a great view, swim in the safety of a netted area to keep the jellyfish at bay or relax on a rented deck chair. Helen and I settle in the shade of a huge frangipani tree on the concrete benches, actually more comfy than a bamboo deck chair on the beach. We sit and watch the throngs of people tackle the climb up and the descent back, there certainly is a difference for many in their appearance before and after. Following our time here we head back to the boat, time now to freshen up for breakfast, pack our bags and head back upstairs. Breakfast, like our cabin, is better here than the hotel in Ha Noi. Fresh pastries, the obligatory egg station and Pho Bo satisfy my appetite. 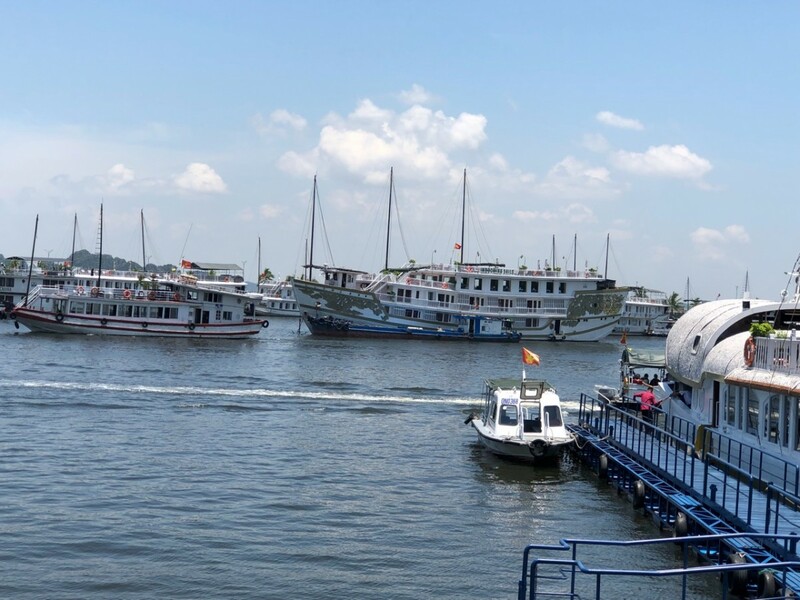 After paying our drinks bill it’s time to sit back and chill before we transfer back to the dock and then into our van for the trip back to Ha Noi.